Dye or paint to cover a grease spot on a formal dress? As I was reading through your website, I believe the answer is fabric paint; however, I am still unsure. I have a beautiful dress I wore as a wedding guest and somehow grease from a chair got on the back of my dress. The dry cleaner did all that they could to get it out but it left a grey mark on the back of my very light pink dress. The fabric shell is 54% polyester, 38% viscose, and 8% elastane. The liner is 97% polyester and 3% spandex. Should I use polyester dye or fabric paint? brilliant metallics, perfect for natural or synthetic fabrics. 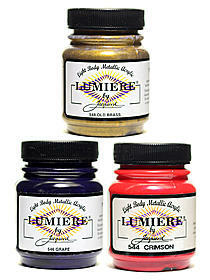 Jacquard Lumiere can be screened, stamped, stenciled, marbled, printed, or airbrushed (25% water mix required for airbrush). 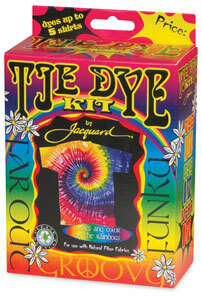 Polyester dye is not an option with spandex-blend fabrics. To dye polyester with polyester dye (also known as disperse dye), you must boil the fabric in the dye for a minimum of half an hour at a hard boil. Spandex (also known as elastane or Lycra) must never be exposed to high heat, over 140° F. The heat required to dye the polyester would ruin the spandex. The viscose rayon is a form of cellulose, which must be dyed with an entirely different type of dye that is easier to use, but it’s not enough to dye just the viscose. Fabric paint will be great if you try to produce an entirely different look. For example, you could sponge an irregular design of pearlescent colors onto your dress, or block-print butterflies in metallic colors, or brush on swirls in a darker shade of opaque pink fabric paint—just to give you some ideas. However, there is no possibility of simply restoring the gray mark to blend in with the pale pink of the rest of the dress. Even if you happen to find an exact match for the pale pink, or manage to expertly mix opaque white fabric paint with pink to get an exact color match, the painted spot will always be perceptibly different in reflectiveness and opacity. Make this look intentional by creating a design, whether it is striking in contrast or very subtle, that covers the entire garment. It is important to use an opaque paint, not a transparent paint, because transparent paint will not cover anything up, as the problem will show right through it; metallic and pearlescent fabric paints are opaque, so they are fine for covering. One brand of good metallic and pearlescent fabric paints is Jacquard Products’ Lumiere fabric paint, which comes in a wide range of very sparkly colors that leave only a very slight feeling on the fabric; they are not thick and rough like some types of fabric paint. This entry was posted in disperse dye, fabric paints and pigments on September 22, 2014 by pburch.